You are here: Home Latest World News Is There a Remittance Trap? RALPH CHAMI is an assistant director in the IMF’s Institute for Capacity Development, EKKEHARD ERNST is chief of the macroeconomic policy and jobs unit at the International Labour Organization, CONNEL FULLENKAMP is professor of the practice of economics at Duke University, and ANNE OEKING is an economist in the IMF’s Asia and Pacific Department*. Workers’ remittances—the money migrants send home to their families—command the attention of economists and policymakers because of their potential to improve the lives of millions of people. Amounting to over $400 billion in 2017, remittances rank between official development assistance and foreign direct investment in terms of size. Such massive financial flows have important consequences for the economies that receive them, especially when many countries receive flows that are large relative to the size of their exports or even their economies. Many argue that remittances help economies in two ways. First, because remittances are person-to-person transfers motivated by family ties, these transfers from outside the country help relatives back home afford the necessities of life. But remittances also have the potential to fuel economic growth, by funding investment in human or physical capital or by financing new businesses. Economists have worked to measure both of these effects. Many studies confirm that remittances are essential in the battle against poverty, lifting millions of families out of deprivation or bare subsistence. But at the same time, economic research has failed to find that remittances make a significant contribution to a country’s economic growth (see Chart 1). The latter result is puzzling, especially given the finding that remittance income helps families consume more. Consumption spending is a driver of short-term economic growth, which in turn should also lead to longer-term growth as industries expand to meet the increased demand. But research that digs deeper into the remittance-growth nexus increasingly suggests that remittances change economies in ways that reduce growth and increase dependence on these funds from abroad. In other words, there is increasing evidence of a remittance trap that causes economies to get stuck on a lower-growth, higher-emigration treadmill. Consider the case of Lebanon. For many years, this country has been one of the leading recipients of remittances, in both absolute and relative terms. During the past decade, inflows have averaged over $6 billion a year, equal to 16 percent of GDP. Lebanon received $1,500 a person in 2016, more than any other nation, according to IMF data. Given the size of these inflows, it should not be surprising that remittances play a key if not leading role in Lebanon’s economy. They constitute an essential part of the country’s social safety net, accounting on average for over 40 percent of the income of the families that receive them. They have undoubtedly played a vital stabilizing role in a country that has endured civil war, invasions, and refugee crises in the past several decades. In addition, remittances are a valuable source of foreign exchange, amounting to 50 percent more than the country’s merchandise exports. This has helped Lebanon maintain a stable exchange rate despite high government debt. While remittances have helped the Lebanese economy absorb shocks, there is no evidence that they have served as an engine of growth. Real per capita GDP in Lebanon grew only 0.32 percent on average annually between 1995 and 2015. Even during 2005–15, it grew at an average annual rate of only 0.79 percent. Lebanon is not an isolated example. Of the 10 countries that receive the largest remittance inflows relative to their GDP—such as Honduras, Jamaica, the Kyrgyz Republic, Nepal, and Tonga—none has per capita GDP growth higher than its regional peers. And for most of these countries, growth rates are well below their peers. It is important to recognize that each of these countries is dealing with other issues that may also interfere with growth. 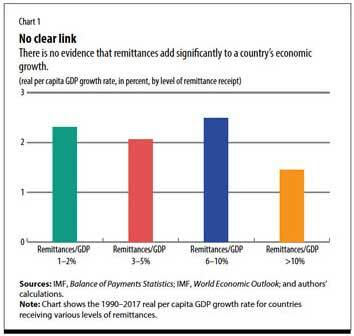 But remittances appear to be an additional determining factor rather than just a consequence of slow growth. And remittances may even amplify some of the other problems that restrict growth and development. Returning to the case of Lebanon, the country’s well-educated population could be expected to point to robust growth. Lebanese families, including those who receive remittances, spend much of their income on educating their young people, who score much higher on standardized mathematics tests than their peers in the region. Lebanon is also home to three of the top 20 universities in the Middle East, and researchers at these universities produce more research than their regional peers. Lebanon’s abundant remittance inflows could provide seed capital to fund business start-ups led by its well-educated citizens. But statistics show that Lebanon has much less entrepreneurial activity than it should, especially in the high-tech information and communication technology sector. The size of this sector is less than 1 percent of GDP, and Lebanon scores very low on international gauges of this sector’s development. Studies of the overall spending habits of remittance-receiving households in Lebanon show that less than 2 percent of inflows goes toward starting businesses. Instead, these funds are typically spent on nontraded goods such as restaurant meals and services, and on imports. Instead of starting new businesses—or even working in established ones—many young Lebanese choose to emigrate. The statistics are stark: up to two-thirds of male and nearly half of female university graduates leave the country. Employers complain of an emigration brain drain that has caused a dearth of highly skilled workers. This shortage has been identified as a leading obstacle to diversifying Lebanon’s economy away from tourism, construction, and real estate, its traditional sources of growth. For their part, young people who choose to seek their fortune elsewhere cite a lack of attractive employment opportunities at home. Part of the remittance trap thus appears to be the use of this source of income to prepare young people to emigrate rather than to invest in businesses at home. In other words, countries that receive remittances may come to rely on exporting labor, rather than commodities produced with this labor. In some countries, governments even encourage the development of institutions that specialize in producing skilled labor for export. But why would this situation develop and persist? Research into both the household-level and economy-wide effects of remittances on their recipients provides an answer to this question. The impact on individual countries that receive significant remittances—such as Egypt, Mexico, and Pakistan—has been studied, and cross-country analysis of a variety of countries that receive various amounts of remittances (and of those that send rather than receive remittances) has been performed as well. The insights from the academic literature can be combined into a consistent explanation of how and why economies that receive significant remittance inflows may become stuck at low levels of growth. To begin with, remittances are spent mostly on household consumption, and the demand for all products (nontraded and traded) in an economy increases as remittances grow. This places upward pressure on prices. The flood of foreign exchange, along with higher prices, makes exports less competitive, with the result that their production declines. Some have referred to this syndrome as Dutch disease (see Chart 2). The effect of remittances on work incentives makes this problem worse, by increasing the so-called reservation wage—that is, the lowest wage at which a worker would be willing to accept a particular type of job. As remittances increase, workers drop out of the labor force, and the resulting increase in wages puts more upward pressure on prices, further reducing the competitiveness of exports. Resources then flow away from industries producing tradable products that face international competition toward those that serve the domestic market. The result: a decline in the number of better-paid, high-skill jobs, which are typical in the traded sector, and an increase in low-skill, poorly paid jobs in the nontraded sector. This shift in the labor market encourages higher- skilled workers to emigrate in search of better-paying jobs. Meanwhile, the cost of living for most families rises along with domestic prices, and the loss in competitiveness means that more products must be imported, hurting economic growth. This in turn increases the incentive for family members to emigrate so that they can send money home to help relatives shoulder the burden of the higher cost of living. To make matters worse, remittances are often spent on real estate, causing home prices to rise and in some cases stoking property bubbles. This provides a motive to emigrate for young people seeking to earn enough to buy a home. The result of all this is a vicious circle of emigration, economic stagnation, rising cost of living, and more emigration. Governments could potentially mitigate or break this cycle by taking steps to keep domestic industries competitive. But policies that can accomplish this, such as improving the education system and physical infrastructure, are expensive and take years to implement. And they require strong political will to succeed. 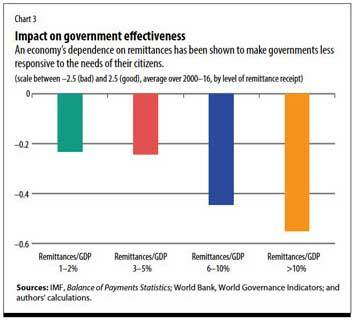 As research has shown, however, remittances have important political economy side effects (see Chart 3). In particular, large inflows allow governments to be less responsive to the needs of society. The reasoning is simple: families that receive remittances are better insulated from economic shocks and are less motivated to demand change from their governments; government in turn feels less obligated to be accountable to its citizens. Many politicians welcome the reduced public scrutiny and political pressure that come with remittance inflows. But politicians have other reasons to encourage remittances. To the extent that governments tax consumption—say through value-added taxes—remittances enlarge the tax base. This enables governments to continue spending on things that will win them popular support, which in turn helps politicians win reelection. Given these benefits, it is little wonder that many governments actively encourage their citizens to emigrate and send money home, even establishing official offices or agencies to promote emigration in some cases. Remittances make politicians’ job easier, by improving the economic conditions of individual families and making them less likely to complain to the government or scrutinize its activities. Official encouragement of migration and remittances then makes the remittance trap even more difficult to escape. The absence of clear evidence linking remittances to increased economic growth—and the lack of examples of countries that experienced remittance-led growth—suggests that remittances do indeed interfere with economic growth. The example of Lebanon, moreover, gives a concrete example of how the remittance trap may operate. And if a remittances trap does exist, then what? Clearly, given their importance to the well-being of millions of families, remittances should not be discouraged. Is the remittance trap simply the cost societies must bear in exchange for a reduction in poverty? Not necessarily. 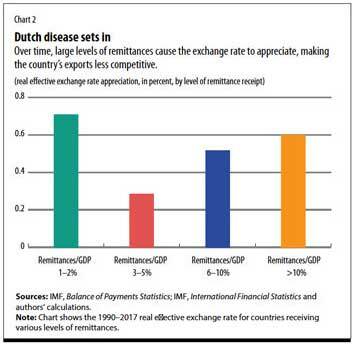 Preventing the two downsides of remittances—Dutch disease and weaker governance—could help countries avoid or escape the remittance trap. Improving the competitiveness of industries that face foreign competition is the general prescription for mitigating Dutch disease. Specific measures include upgrading a country’s physical infrastructure, improving the education system, and reducing the cost of doing business. Governments could also play a more active role in stimulating new business formation, including seed funding or other financial assistance for start-ups. At the same time, remittance-receiving countries must also push for stronger institutions and better governance. Enhancing economic competitiveness and strengthening governance and social institutions are already considered essential to the inclusive growth agenda. But the remittance trap lends urgency to these goals. Avoiding this potentially serious pitfall of remittances may actually be the key to unlocking their development potential by removing a previously unrecognized obstacle to inclusive development. *Opinions expressed in articles and other materials are those of the authors; they do not necessarily reflect IMF policy.